As more and more people have started using smartphone devices, the need for a responsive website has become more of a necessity than just a need. In just over a decade, smartphones were not the norm how society used to interact with one another. However, with the passage of time, new innovations in the smart technology world emerged, giving rise to a whole new generation of individuals. Facebook came full-circle from an invite-only platform to a globally recognized public forum. Online shopping experiences came into existence with new entrants into the market. Amazon became one of the most powerful cloud infrastructures in the world. And finally, Artificial Intelligence and Machine Learning opened a whole new world of innovation, giving rise to chatbots, smart systems, and personalized experiences. Do you ever wonder what the term responsive actually means in the website design world? Modern-Day responsive website design works seamlessly across a range of devices including desktops, laptops, tablets, smartphones, etc. Such websites are specifically coded to adjust and scale on any type of screen size accordingly. The best thing about such responsive website design is that it automatically stretches, shrinks and visually adjusts to the desired screen size, in order to provide the best user experience. Although the HTML code for responsive web designs is the same, the CSS code has minute differences which make the content and design read just itself within the screen. Just like any other website design, there are some pros as well as cons of using the responsive web design. One of the major advantages of getting a responsive website design is that it eliminates the need of getting a separate mobile website for your respective business. This means that you won’t have to pay up extra to an app developer, so they can create the code of your web design from scratch. Besides, responsive website designs can automatically resize images, texts, forms and buttons to use the maximum screen space in a systematic manner. In responsive web design, the text becomes easier to read across a range of smart devices. You can use fingers to zoom in and zoom out on the screen. If something befits the modern-day web standards, it is none other than responsive web design. Websites that are specifically designed for laptops and desktops are now deemed outdated and may not look the same on mobile devices. Hence, it becomes rather difficult to manage these websites on smartphones. With a responsive website design in place, you will only have to update your content in one place. Responsive website design is just a standard website design with single standard code. This way, you won’t have to update content on mobile web designs or static web designs separately. When you opt-in for a responsive website design solution, you can also benefit from it on the SEO level. How does it happen? Practically it happens because Google does not require crawling the same content on both mobile and static websites at the same time. Instead, it just crawls the content on one platform. Although the pros far outweigh the cons when it comes to responsive website design, there are still some flaws which we can identify and point out. These flaws can be a little problematic if necessary precautions aren’t taken. A few responsive website designs require web components to be scaled down, which makes certain pages of the website inaccessible. On the other hand, users have full access to all the features you are offering on a separate mobile website. Responsive website designs that are not properly optimized may often take longer than usual to load. While the images on a responsive website design are visually scaled down, it takes some time to scale back up to fit on different screen sizes. It means that you won’t have a similar page speed or load time when you access a particular website on a range of devices. The type of connection also matters. One more negative repercussion of having a responsive design is that the website content is normally stacked vertically to accommodate smaller screen space. Websites which have more content than usual often push important buttons and features far down below. Users who are not much fond of long scrolling ultimately end up wondering what the business is actually offering to consumers. Discussed above are just some legitimate pitfalls that can befall website designs that are not keenly worked on. Good responsive website design requires a commendable content strategy, remarkable branding, effective features, and amazing navigation. 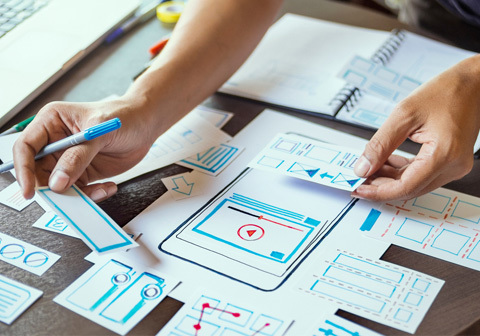 It’s not all about the design; to make a digital product a thriving success, you need to mix multiple digital aspects and amalgamate them together to produce the most desirable results for the audience. Branex is a web design and development platform that is your one-stop shop solution for all. We have helped multiple businesses build up from scratch. If you want to make your next website responsive or wish for a separate mobile website, Branex can help you build it all.